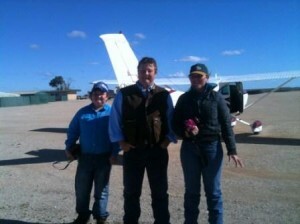 Joe, Andy Morris & Esther , before take off, from Nullabor Roadhouse scenic whale watching flight. Nullabor Roadhouse is a welcome oasis after the two day haul from Nundroo. We camped in the scrub inbetween Nundroo and Nullabor and it was wet and cold. Luckily our camp was on an old gravel pile where the ground was good. Got a good early start on Saturday and Esther rode 75kms into Nullabor getting here about 4.30pm. 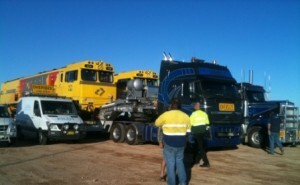 When she arrived here on Surprise two massive 750 hp prime movers pulled up towing train engines from Brisbane! Amazing sight. We had a yarn with the drivers. We had to build our yards for the horses. There’s absolutely no grazing for them here, only salt bush and spear grass. Had a great day which included the flight with Pilot Andy Morris whose contracting here from the Roadhouse with scenic whale watching tours over the Great Australian Bight. Both Esther and Joe rated it as one of the most amazing things they’ve done ever! Now that’s saying something. The days are melding into each other on the Nullabor, we’re on the ‘treeless’ section of the plains now, which is a pain for me the strapper as there’s no where to tie horses up out of the wind a little! Anyway that will change down the road! Off in the morning heading toward Eucla the WA/SA border. We’ll take two and a half days to reach the border. We’ll actually pull up at Border Village on the SA side on Wednesday night and we have to go through all our quarintine criteria, including yarding horses overnight to ’empty’ them of their NSW feed, and we have 3 pallet loads of WA product waiting for us. We also have to surrender any fruit and veges, honey, nuts, seeds. Of course we’re trying to arrive with as little of all those items as possible. Additionally we have to remove any dirt from SA/NSW from the truck too. Good luck with that for us! Will need to get somewhere where there’s actually water to spare to clean it. I would encourage any travellers crossing the Nullabor to have a stop over here. The environment is amazing, (reminds me of Hay Plains only bigger) the Nullabor Plains is 200 000 square kms! This roadhouse accommodates campers, caravans, and also has bunkhouse style accommodation and good motel rooms. The best showers and good laundry facilities, all of which we road tested! I’m only sorry we couldn’t have another day here! Met up with travellers in the bar, had a quiet beer and talked about ride4acure. 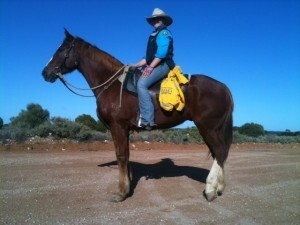 Actually met a lady from Gisborne Saddlery I talked with last July when I was preparing to ride into Melbourne at the end of my pack horse ride. She and her husband have been travelling around WA for a while and where fuelling up when I pulled the truck in to the camping area. Small world. The horses are going great. Getting fitter every day… unbelievable how good they look for such grueling work. But they keep pulling up sound and the feedback from people on how magnificent they look is testament to the quality horse feed we’ve got from both Mitavite and Manuka. The other fantastic thing is the top quality tungstan plugs and tungstan road nails we have been sponsored with in addition to our horse shoes from Clarke Horseshoes from Wingham, with the tungstan we’ve prolonged the life of the shoes x 4 or 5 times at least. So fingers crossed we’ll be right to Kalgoorlie! We will definitely be out of phone range now for a couple of weeks. We lucked it here with a phone tower right at the roadhouse! We didn’t know about this. But we’ve been told no more! This entry was posted on Sunday, July 3rd, 2011 at 10:50 pm	and is filed under General. You can follow any responses to this entry through the RSS 2.0 feed. You can leave a response, or trackback from your own site.